I was born in 1950 in The Hague. I started doing portrait drawings in 1975 on commission as well as according to my own design. In 1985 I took a few portraits of Leo Ferré for the cover of the graphic volumes by Wim Bors. In the early 1990s I developed an interest in gold and silversmith design. I took courses with Anke Kuypers and acquired recognition as a gold and silversmith by the province of Fryslan in 1995. In 1996 I set up ‘ Atelier 11’ together with Wim Bors. I have been an independent gold and silversmith since then, and I work in my studio on the Oudebildtdijk. 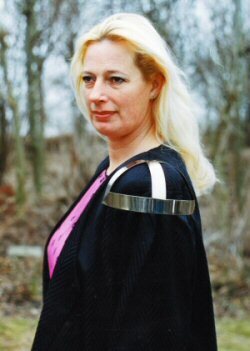 In 2001 I joined the Guild of Frisian Gold and Silversmiths. I make pieces of jewellery according to my own design or on commission. When I get a commission I allow myself to be inspired by the wishes of the customer and the image which I acquire when I speak to the person. It is exciting and fascinating to constantly design a unique piece of jewellery which suits that particular person and yet also carries my own signature so to speak. In my autonomous work I allow myself to be inspired by basic shapes in nature which acquire their own interpretation in necklaces, brooches, rings and useful objects. In 2004 the gallery De Valk in Harlingen held a review of my work in the last ten years. Elegance and simplicity are the key words to my work which meets with a warm reception in an ever growing circle of galleries and museums.